A call to carry Christ’s love and mercy to families in poverty around the world. This eminently practical book by two leading experts on poverty alleviation offers a clear plan to help ordinary Christ-followers translate their compassion into thoughtful action. Authors Peter Greer and Phil Smith draw on their personal experiences to discuss proven solutions for effectively alleviating poverty. Created to Flourish examines the pitfalls of traditional approaches and outlines a new model of economic development aimed at breaking the cycle of dependency. Through discipleship-based savings groups and small loans, families in poverty are employing their God-given talents to provide for their families and serve their communities. With photographs showcasing the dignity of clients from around the HOPE International network, this book provides straightforward guidance for individuals and groups eager to carry God’s justice, mercy, and compassion throughout our world. Any tips will be directed to support the work of HOPE International. The present age is a truly unique historical moment. The richest people ever to walk the face of the earth coexist with billions living in conditions not fit for creatures bearing the image of almighty God. How are Christians to respond to this crisis? 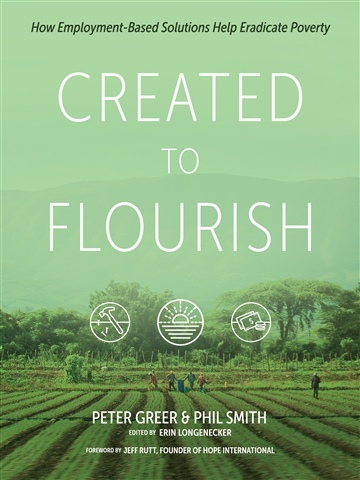 Drawing on their many years of experience in microfinance, Peter Greer and Phil Smith challenge readers to join God’s mission of helping those in poverty to flourish through restoring them to sustainable work. This book is a timely and prophetic word, combining solid theology, best practices, and deeply moving stories from the front lines. Created to Flourish is an honest, insightful, and practical resource forged from the vast experience of the authors who deeply care about seeing people lifted from poverty. I am grateful to have this book in my hands and know it will add wisdom to all those who have joined the revolution. My friends Peter and Phil have written a book about respect—not pity. They have not written a book about money—but about discovering value in hidden places with explosive benefits for individuals, families, and entire countries. anyone who wants to truly make a difference in the face of poverty. Moreover, Greer and Smith rightly believe that physical poverty and spiritual poverty can be addressed together without losing the integrity of the other. justice, this book is arriving just at the right time. Created to Flourish is a light to the path of social entrepreneurs, students, and philanthropists showing how to help the poor physically while proclaiming the Good News of Jesus. You will learn how to avoid unintentional harm and how to do the greatest good. This book illustrates integrated solutions to spiritual and physical poverty with clarity and conviction. A must-read as we critically consider biblical stewardship of our resources.